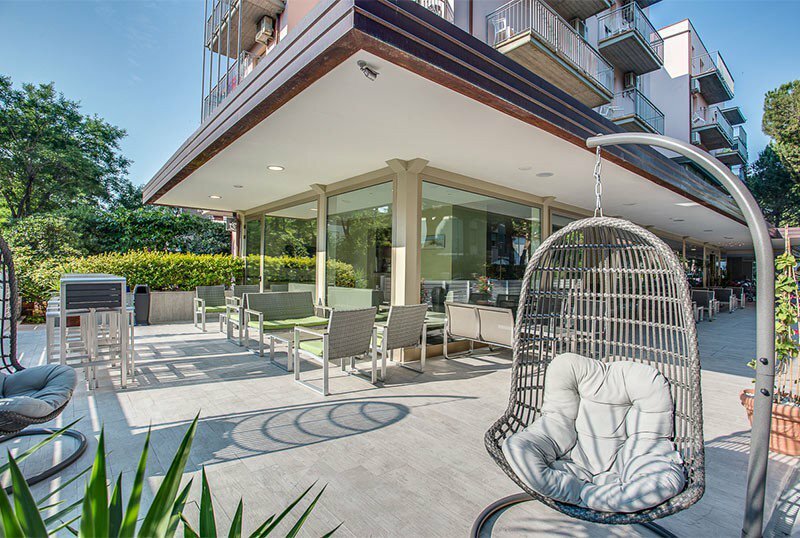 The Hotel Riz , a 3-star family-run hotel in Cervia, recently renovated throughout the ground floor, offers a garden, a furnished open-air porch, family services including a rich entertainment program and an inflatable playground, parking, WI-FI and bicycles . Free small pets are allowed. The hotel is located in a quiet avenue just a few minutes walk from the beach and the only stretch of free access to Cervia. CLASSIC: has all the services listed above and a private bathroom with a modular shower, without a shower tray. COMFORT: present both in the hotel and at the Depturance Volturno, they have renovated bathrooms with shower and all the services available in the Classic solution. SUPERIOR: completely renovated and soundproofed, to all the services listed above are added TV 32 ", electric shutters, door opening to custom card and bathroom with shower. Garden, free bicycles, gym, bar, restaurant with open-air porch, reading room, elevator, luggage storage and newspapers. Theme dinners are organized every week, with evenings with musical performances, magic shows, baby dance and karaoke. AIR CONDITIONING : all rooms are air-conditioned without additional costs. BREAKFAST: sweet and savory buffet with homemade desserts, jams, cold cuts, cheeses, fruit juices and more. LUNCH AND DINNER: 3 choice menu with fresh pasta, meat and fish dishes, hot and cold appetizers buffet. OTHER: every Friday aperitif in the garden for everyone. Every Tuesday a day dedicated to typical local cuisine with an aperitif based on cured meats, piadas, cheeses and local wines. In hotel: indoor and outdoor playground area with inflatable, bicycles with child seats, entertainment with mini club, shows and workshops, magic school once a week and balloon sculptures, lunches and theme dinners with entertainers (pizza and chips party, hamburgers and party chips, hot dogs and party chips, croquettes, etc ...), cotton candy cart, popcorn, bottle warmer, room with kitchenette equipped for preparing baby food with crockery, fridge and microwave. For a fee: stroller and baby sitter rental. In the room: cot with linen, fall protection rails and baby baths. At meals: high chairs, baby food prepared at flexible hours, afternoon snack, placemats to color, baby cutlery and dedicated menus. The hotel has an agreement with the Bagno Marco n. 184. At guests' disposal: bar, restaurant, entertainment, playgrounds, playground, nursery, baby sitter. We offer you, Children Free if sharing with 2 adults. - from 25 May to 14 June 2 Children free up to 14 years! - from 25 May to 28 June 2 Children Free up to 12 years! If you book before April 30th you can have the Comfort Room at the same price (subject to availability). Offer valid for a minimum stay of 7 nights in a room with 2 paying guests and a maximum of 2 free tickets. Offer valid for a minimum stay of 7 nights in a room with 2 paying guests and a maximum of 2 free tickets per room. Book your holiday by April 30th 2019, you will receive a 20% discount on stays from July 27th to August 9th, minimum 7 days, in the All Inclusive formula, price per person starting from € 420.00.
Who first book better stays! Open summer 2019 with a great price! Book now and grab the best room at a great price! and remember .... children are free up to 14 years! Book by March 30th and you can have the Confort room at the same price! Plus if you bring your grandchildren 2 are Free up to 14 years! Also .. you first book better lodge! After the Christmas holidays, can not you wait to leave? From 25 May to 7 June and from 7 to 14 September. 7 nights in a Superior Room (subject to availability) with a Top All Inclusive package for only € 350.00 per person and 2 children up to 14 years FREE! Rates will be applied to all room types (subject to availability). If you book before the 30th of April, unlimited drinks at meals (Plus package) and a € 30.00 voucher to spend at the hotel bar. Hurry up, those who first book better stay! Offer from May 25th to June 7th. Take advantage of the best time to restore body and soul with warm sun and quiet beaches. 7 nights in All Inclusive € 308.00 per person inclusive of water, wine and beach service! 2 children free up to 14 years (minimum stay of 2 people with at least an Over 65 in Classic Room). Furthermore .... whoever books better the first time! Seven nights from 10 to 23 August to spend the August family holiday!